3snaps - Mihal Freinquel: Are Shopping Bags the New Designer Bags? In case you haven't heard, word is we're in a recession. Time to cut costs everywhere we can: nights out with friends, bringing sack lunches instead of buying them, and of course, chill out with the shopping. Luckily for me, I mostly shop second hand anyway (see my Goodwill Toward Man: 5 Tips for Thrift Store Shopping post HERE). This is not, however, the case for many Americans - those living in big cities especially. There's always something newer and trendier to buy that brings promise of a more unattainably stylish, more attractive you. But are you willing to pay the price? Maybe if you don't eat for 3 days out of the week it can be factored into your budget. Uh, that sounds worrisome. Want a more realistic option? Stroll down any street in New York, get on any subway, and you'll see that women - old and young, hot and homely, rich and poor - are all discovering a way to show their so-called status, without actually having to spend thousands of dollars on their fancy store purchases. How are they possibly doing this?? The fancy store shopping bag is now being used in lieu of the designer handbag itself. Prada, Manolo Blahnik, Gucci - or even high end department stores like Henri Bendel or Saks Fifth Avenue. Shopping bags are now the statement. The catch, of course, is that you have to buy something at these stores at least once to acquire the bag - or know somebody who is willing to give you theirs. 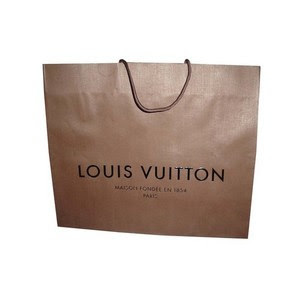 Once you've done this - who needs to buy 5 different Louis Vuitton monogram bags to show you're in the know? 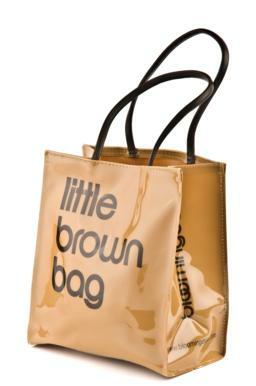 Buy one - then carry the shopping bag around with you as your handbag on alternate days. It doesn't matter what you put in there - your lunch, your gym clothes, treat it like a purse, or hell, leave it empty! As far as anybody else is concerned, you have a new bag in there. You're rich, trendy, and everybody loves you. This trend has become so huge, that now stores are capitalizing on the popularity of their signature shopping bags, and making the shopping bags into real bags - and selling them! 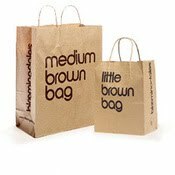 Bloomingdales, known for their "brown bag" concept shopping bag (seen below), has taken the "little brown bag", made it waterproof, thrown some leather handles on it, and sells it for $20! Not kidding, see HERE. Oh right I remember! If you wanna be stylish yet thrifty, ditch the actual designer bag and instead carry a fancy store's shopping bag. As a handbag.